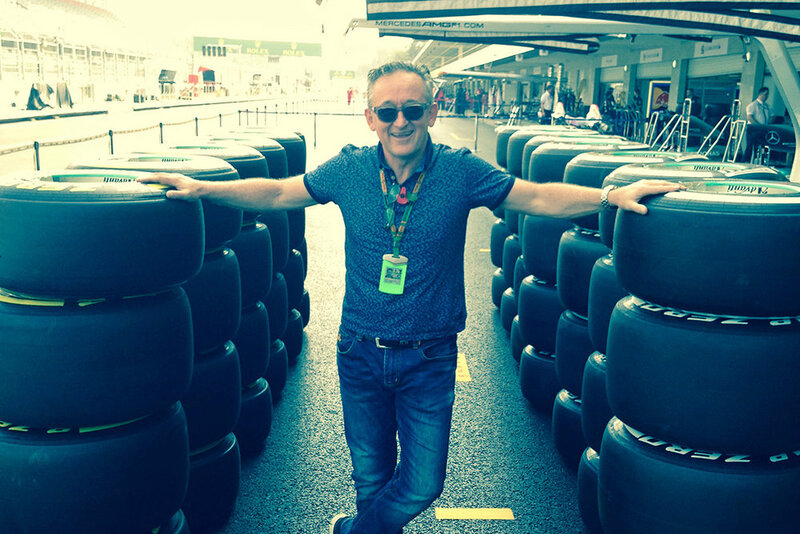 This month's In Conversation With... is with Martin Turner, Former Head of Formula One - Sky Sports & Sky Europe, BAFTA winner. Martin is Sky’s longest serving employee with 33 years at the coal face! The photographs above show Martin at home in his garden with his beloved dog Sherman and in his games room with two much prized Bafta masks, one belonging to him and one to his father. Q. What was your childhood dream? A. To play any sport for England and tennis at Wimbledon. Q. What did you play? A. I was a tennis coach and an aspiring badminton player, Captain of Kingston Polytechnic and played for Woldingham. Q. What did you do when you left school? A. I went to Kingston Polytechnic to study French and English. At the age of 22 I was a tennis coach for Club Med and when I came back I realised that I wanted to become a director in sports television. Q. How did you get your first job at Sky? A. I worked as a trainee video operator at Molinare, we were broadcasting SKY channel in the early days in the early 1980’s - I got to know the people working there and when a position became available I went for the interview as assistant transmission controller. Q. How did you get into Formula One? A. When Sky surprisingly got the rights to broadcast Formula One in 2012 I was asked by the MD of SKY Sports, Barney Francis, if I would create a specific sports channel for Formula One. Q. What was it like winning a BAFTA and what category did you win it for? A. The BAFTA was for rugby union for England vs New Zealand 26-26 in1997 when I was 39 years of age. I mirrored my father's achievement for the 1966 world cup when he was 39 as well. Q. What did your father do? A. He was head of outside broadcast for Rediffusion and Thames Television. Q. Now that you have left Sky how are you spending your time? A. I consult for Formula One management (the people who run F1) at Biggin Hill working with young producers in a mentoring and creative ideas role. Q. Why did you retire? A. After being diagnosed with Parkinson’s at the end of 2014, over the following two years my wife and I discussed how to re-evaluate the work life balance and we made the decision that the 2017 Monaco Grand Prix would be my last Grand Prix. Having worked full on for 33 years achieving a comfortable life balance was essential to our well-being. I’m currently working with Parkinson UK on an ambitious project to lobby government for more research funds into this incurable neurological disease. This link tells you more. The photographs below show Martin during his Formula One days looking very relaxed and at home. Many thanks to Martin for taking the time to tell me about his career, I very much enjoyed talking to him and hearing about his fascinating career, the above is just a snippet about this illustrious man. I wish him well with his retirement which I’m sure will be just as fascinating. British Photographer with a career spanning over three decades, photographing people, events and collections.